Brimming with old school romance, this throw features your initials carved into a heart. 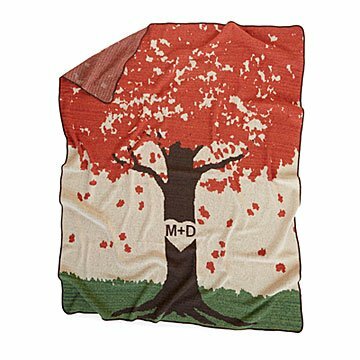 Whether you or your favorite couple are newly entwined or more seasoned cuddlers, this personalized throw with initials in a heart-carved tree makes for a cozy cover-up. It's cotton content (75%) comes from surplus, pre-consumer material collected from apparel and upholstery factories, recycled into new yarn instead of discarded. The weave incorporates 25% acrylic for a little stretch, so you won't get in a tug of war with your couch-mate for coverage. Choose from an autumnal scene—perfect to celebrate a fall anniversary, spring scene bursting with blushing cherry blossoms, or snowy vista that recalls fireside snuggles with cups of cocoa in hand. Made in Binghamton, New York. Growing up, Michigan farm girl Sandy Martin witnessed first-hand the the health repercussions of conventional farming with pesticides. Later, when she worked in the apparel industry, she saw how some manufacturers negatively affected the environment and communities where they operated. So with the help of her husband Jim, Sandy founded an apparel company based on honesty, environmental awareness, and high-quality American-made designs. Their manufacturing process is completely green and uses no PVCs, plastisols, heavy-metal inks, or chlorinated bleaches. They reclaim waste fabric from their own production, from other garment makers, and from thrift stores and give these cast-offs new life in creative items like T-shirt scarves. Headquartered in a 19th century horse carriage terminal on the shores of Lake Winnebago in Oshkosh, Wisconsin, the Martins' operation is dedicated to creating apparel jobs both there and throughout the U.S. They also work with Aspiro, a non-profit in Green Bay, Wisconsin that specializes in teaching job skills to cognitively disabled adults. Some of the Martins' designs are cut and sewn by adults in the program, promoting independent living. Machine wash cool water,tumble dry on low heat setting. Do not use bleach. This is a made-to-order item. If you order today your item will ship no later than 5/29/2019. This was a perfect wedding gift for my great niece. They loved their very own initials in the "tree" and said it would be a keepsake and tied in so well with the theme of their wedding. They are tree huggers and conservationists! Great gift, will be used & hung on the wall. I have ordered from Uncommon Goods before and have never been disappointed. Every season this blanket is prominent in our house - in warmer seasons draped over a chair, colder seasons my husband always has it over him in his chair. Beautifully made, unique, and long lasting/holds up after washes. I need more excuses to gift this to others. Seeing it the catalog reminded me I needed to share what a great gift this is with others. I bought this for our second (cotton) wedding anniversary. My wife loves the fall because of the changing colors of the leaves, and it was the theme of our wedding. As wedding favors, we handmade wooden coasters for each of the guests, and wood burned a design on each: a tree with our initials on the trunk with leaves falling (the leaves had the wedding date in them). I saw this blanket and how remarkably similar it was to our design and decided it would be the perfect gift, and it was. My wife loves it, and we now have it decorating a day bed in our living room. My son and his wife loved the look and quality of this throw. And they loved that it was made from recycled fabrics. The fine craftsmanship and design make it a lovely addition to their home. DO NOT BUY THIS PRODUCT! Would give 0 Stars if I could. Ordered blanket mid-August as a wedding gift for a dear friend. In early October, contacted Uncommon Goods customer service to let them know it had not been delivered and they said they don't know where it is and why it hasn't been delivered. Completely unacceptable! Order from Etsy, or any other merchant, but stay away from this option if you want to actually have the item you paid for delivered. This is a perfect gift for any couple! I really wanted to give a personalized gift to my friends for their new home. This fit the bill perfectly. The go to wedding gift! This is a great gift for anyone getting married. Everyone we got this for loves it and raves about it being so soft, and of course the initials are the cutest thing. I have to take their word on it as I have never seen any of them in person, I believe we have now ordered 4 of these with more in the future as we have more weddings coming up.